Roundleaf Lindernia is an erect or diffuse herbs, rooting at lower nodes. Leaves 0.8-1.3 x 0.5-1 cm, ovate to round, base and tip rounded, margin rounded toothed to subentire, basally 3-nerved, stalkless. Flowers are borne singly in leaf axils, on stalks 0.5-1 cm long, slender. Calyx is deeply divided, sepals 5, 2-2.5 x 1 mm, lanceshaped. 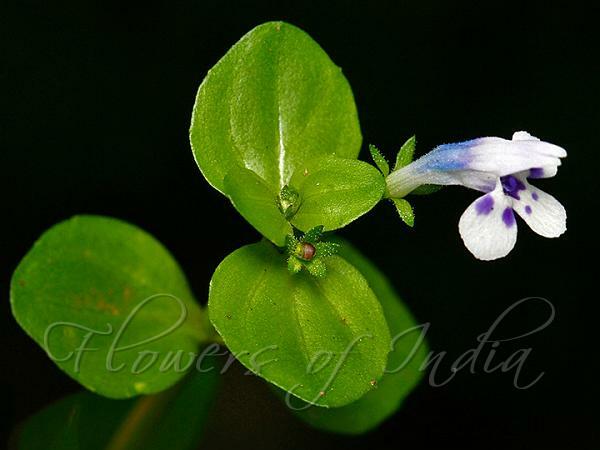 Flowers are about 1 cm long, white with blue blotches at mouth and lobes; lobes round. Stamens are 2; staminodes 2, glandular-rough at base. Stigma 2-lamellate. Capsules are about 3 mm long, nearly spherical, equal to or slightly shorter than calyx. Seeds are about 0.5 mm long, oblong, pale brown. 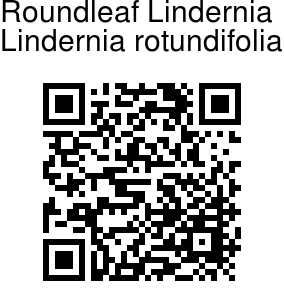 Roundleaf Lindernia is found throughout the Paleotropics. Flowering: August-November.